The Land Rover Discovery Commercial takes one of the most premium SUVs on sale and turns it into a van. It’s an official Land Rover product, converted at the factory, and if you’re looking for a posh, highly capable 4x4 light commercial vehicle that doesn’t look like a light commercial vehicle at all, then it could well be for you. However, as you might expect, the premium part is reflected not just in the vehicle itself – which is rather impressive – but also very much in the price. This is not a cheap way to haul goods, and anyone considering it will need to place a big emphasis on appearance and car-like creature comforts over outright load practicality. In other words, if you think the Mercedes X-Class pickup is expensive, the Land Rover Discovery Commercial probably isn’t for you. It’s so niche, in fact, that the Land Rover press office doesn’t even keep a demo example; so as a means of judging driving impressions and interior finish we’ve borrowed a basic passenger version. Since the commercial variant is quite literally one of these with the rear seats removed and replaced by a ‘hard-wearing load space’, while not a perfect solution this does allow us to draw key conclusions. 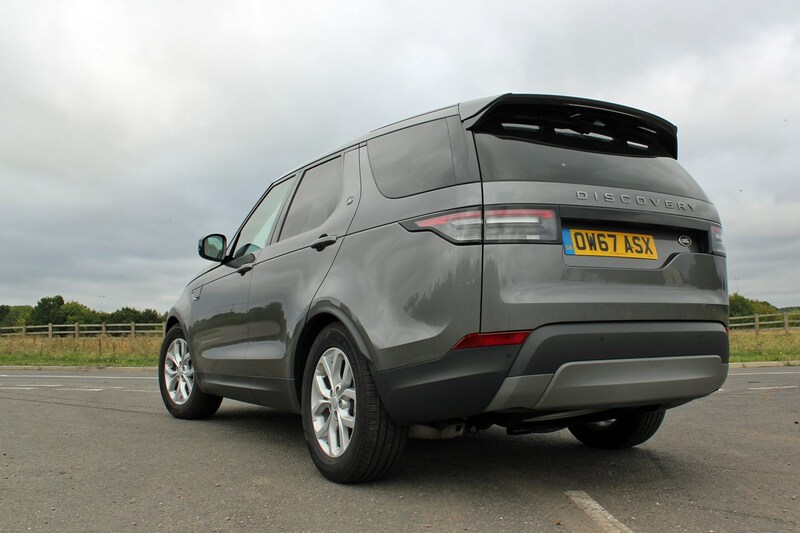 The front of the vehicle where the driver and passenger sits is exactly the same as the standard Discovery, including the outstanding level of standard equipment. Full load area size and specification details for the van variant are none-the-less listed on our dedicated Land Rover Discovery Commercial dimensions page. High-end pickups like the X-Class are certainly potential rivals to the Discovery Commercial; alongside the Mercedes we’d consider the VW Amarok and the Nissan NP300 Navara, for example, and perhaps the Ford Ranger for its muscular appearance as well as its load-carrying capability. Suffice to say, though: the Land Rover Discovery is much nicer place to spend time than any pickup. Potential Disco buyers are more likely to be looking at other commercial 4x4 conversions – such as the Toyota Land Cruiser Utility Commercial and the Mitsubishi Shogun 4Work. Neither of these matches the Land Rover for modernity, quality of interior of finish and on-road driving experience, but both will certainly give the high-tech Discovery a run for its money across off-road terrain. 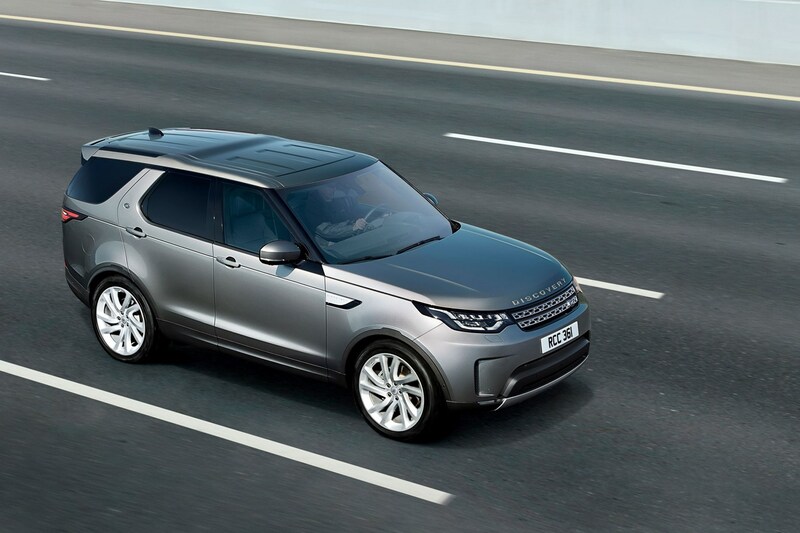 In keeping with its premium promise, the Discovery Commercial was launched with a choice of two engines – 2.0-litre SD4 turbodiesel with 240hp and 3.0-litre TD6 turbodiesel with 258hp – and in three trim levels: S, SE and HSE. The 3.0-litre TD6 was replaced by a newer 3.0-litre SD6 with 306hp in mid-2018. The passenger version we’ve tested was a 2.0D SD4 in SE specification, a nicely representative middling specification. Although when it comes to the Discovery, not much is really middling at all – as even the most basic spec is extremely well equipped. 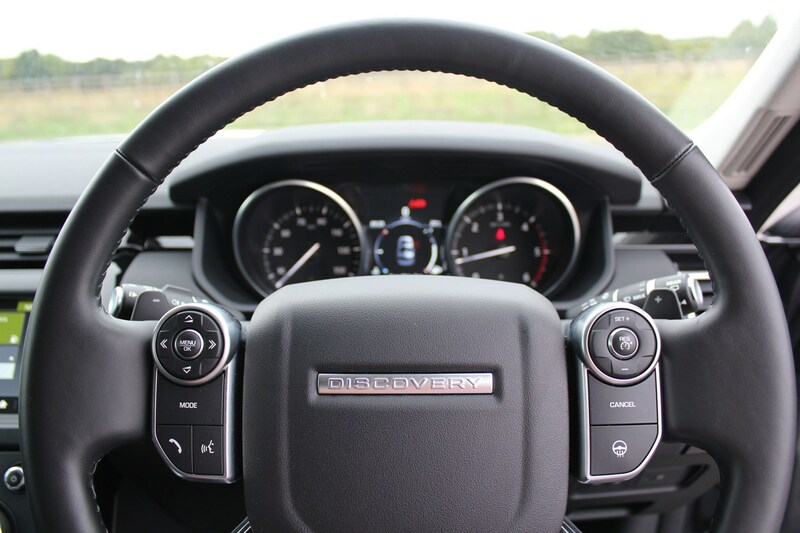 For example, all Discovery Commercial models come with an eight-speed automatic gearbox, high- and low-range gearing, air suspension, powered outer and inner tailgate (on which more below), touchscreen multimedia infotainment system, and a host of electronic gadgets including plenty of the latest safety gear and Land Rover’s famed Terrain Response system for optimised off-roading. So the Disco is expensive, yes. But you’re getting a lot of machine for your money. Unlike the car version of the Discovery, the Commercial model meets van tax requirements – which mean you will pay less in tax for one of these than you would a proper passenger model. Before you start thinking about whether you can get away with is as a company car, however, you should also know that its weight and modifications limited it to van speed limits as well. So you can only legally do 60mph on a dual carriageway. Although given the Commercial looks identical to any other Discovery at a glance, it’ll take an eagle-eyed traffic office to spot the difference. Blending all-terrain load-carrying sophistication with an image suitable for any board meeting, the Land Rover Discovery Commercial is basically a unique proposition in the van market right now – not even those rival commercial 4x4s come close to matching its overall polish. Just keep in mind that its load area and payload are limited compared to almost any conventional commercial vehicle, and given its price you really want to be absolutely certain it meets your needs before committing to buy. 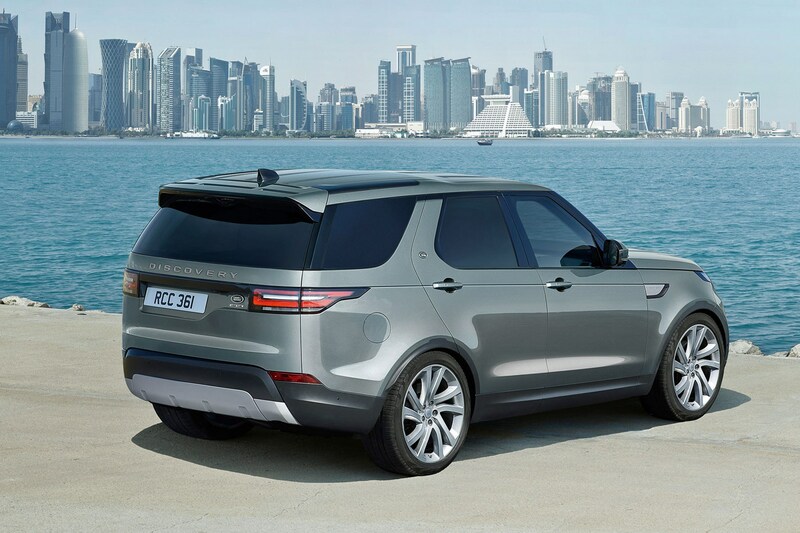 Keep reading for the full Land Rover Discovery Commercial review on Parkers Vans and Pickups. The Land Rover Discovery Commercial is available with a choice of two diesel engines – a 2.0-litre four-cylinder and a 3.0-litre six-cylinder. The four-cylinder motor is called the SD4, and it produces 240hp and 430Nm – which is likely to be more than enough for most uses. The Land Rover Discovery is not, and has never been a lightweight vehicle, and its engines are designed to more than cope with this. This SD4 Commercial variant has an unladen weight of 2,287kg, for example, and can still accelerate 0-62mph in 8.7 seconds. Still, if you do need more performance, the six-cylinder engines will be happy to oblige. Just remember that all versions of the Discovery Commercial are legally limited to the same speeds as vans. At launch in December 2017, the other Disco Commercial engine was a 258hp motor badged TD6. This was replaced in August 2018 by a newer SD6 engine with 306hp and a monster 700Nm of torque as part of what Land Rover refers to as the 2019MY (Model Year) update. The SD6 has enough muscle to see 0-62mph disappear in 7.5 seconds. What’s the Land Rover Discovery Commercial like to drive? As explained above, we’ve only driven an SD4 in passenger specification, but given the front two seats and everything surrounding them remains the same for the Commercial variant (it’s only behind these two seats that the interior differs), this is still instructive. The four-cylinder engine is quiet but powerful, and the standard-fit air suspension keeps cornering roll in check while taking the bite out of all but the worst road surfaces, bumps and potholes. We loaded a large desk into the boot, and there was basically no discernible difference driving the Disco with and without it on board; take the vehicle towards its gross vehicle weight max (just under 3.0 tonnes for the SD4 and just over 3.0-tonnes for the SD6 – see our Dimensions section for more details) and we suspect that though you will notice the weight, the air suspension will still keep things very comfortable and controlled. Not least because the air suspension is also used to vary the vehicle’s ground clearance, separately or as part of the Terrain Response system that comprehensively adapts the Discovery for on and off-road driving. This also alters accelerator response, differential settings and gearbox modes, maximising grip for a variety of surfaces. In addition, the Disco has permanent four-wheel drive with high- and low-range gearing. You’ll actually have to try pretty hard to get stuck. 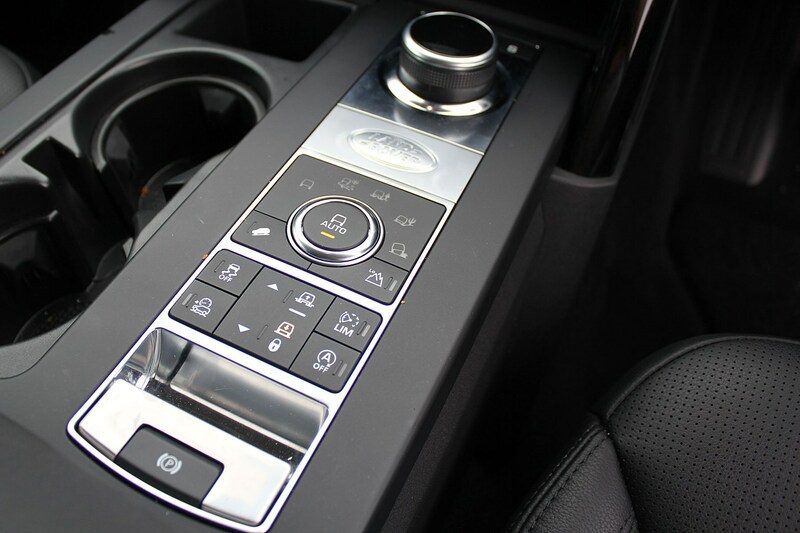 The eight-speed automatic transmission is superbly smooth when left to its own devices, but can be a touch slow to respond; fortunately, there are steering-wheel mounted paddleshifters, and the gearbox is very quick to react to them. Note the wading depth in particular, which is higher as standard than some more extreme off-road-prepared pickups – take the Nissan Navara AT32, for example, which can wade to only 800mm with an optional snorkel accessory, still some 100mm less than the Land Rover. Fair to say, you’ll have to search far and wide to find another light commercial vehicle with a cab interior as nice as the one in the Land Rover Discovery. Everything you touch is either soft or high quality, while the standard-fit InControl Touch Pro infotainment system manages to both look flash and be relatively intuitive to operate. All Commercial versions get leather upholstery and 12-way electrically adjustable seats, for crying out loud. The steering wheel also has a good range of adjustment, so you should be able to find a comfortably driving position without difficulty. The instruments and steering-wheel mounted controls are clear and easy to use. You sit high, too, so forward visibility is good – though if you’re used to driving a car the letter box rear view may take a little adjusting to, as the inner sides of the Commercial version are fitted with ‘concealment panels’. Heavily tinted exterior glass makes this difficult to spot, however, making the Commercial almost indistinguishable from other Discoverys from the outside. What’s different inside the Land Rover Discovery Commercial? Up front the driver and passenger could be in a regular Disco, but the following two rows of seats are completely replaced by a flat load area that butts up against bulkhead that’s part solid, part metal mesh. The load area is quite high, as it matches the height of the boot floor, so getting heavier items on board may be a bit of an effort. 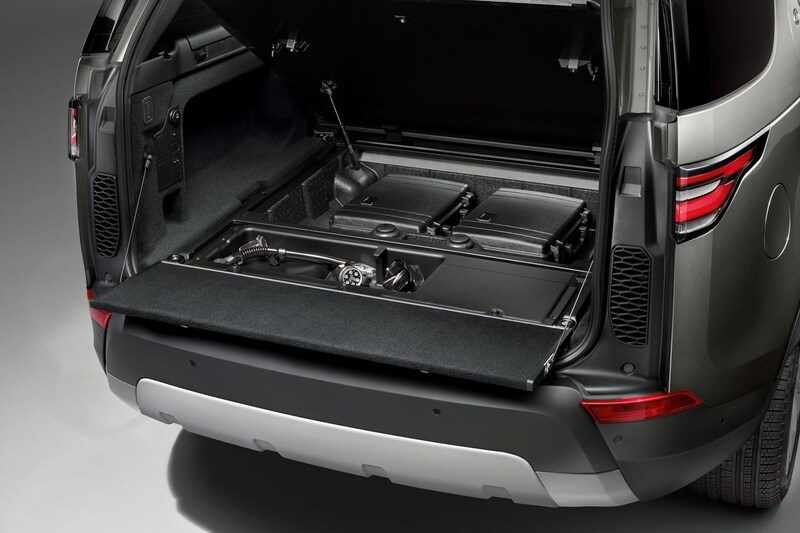 You’ll find additional storage below this load level, including locker-like cubbies that occupy the area where the base of the middle row of seats would have been, and are accessed through the rear side doors – which still open as per the standard vehicle. At the very rear, the load area of all Disco Commercials is accessed by a powered tailgate, operated via the keyfob or by pressing a button hidden in the rear number plate recess. Once the main tailgate is open you’ll find there’s a secondary lip at the very end of the load compartment that acts as a handy blocker to stop items falling out; this is also power operated (automatically if you use the keyfob or by a button), and once folded down will happily double as a seat for an average adult. As well as the standard touchscreen infotainment system, from SE specification upwards, Discovery Commercial is also fitted with a Wi-Fi hotspot and dual-zone climate control. The vehicle also has an unusually high level of smartphone integration, allowing you to operate some of its features via an app. Full details of standard equipment can be found in the Costs and Value section of this review. This is not a cheap vehicle to buy, but its intended audience will no doubt appreciate the level of sophistication and standard equipment it offers versus conventional vans, pickups and rival commercial 4x4s. Given its basic weight, the on-paper fuel economy is reasonable – ranging from a claimed 37.7mpg high from the 2.0-litre SD4, falling to a claimed 36.2mpg low from the 3.0-litre SD6 (when fitted with 21-inch wheels). If you achieve 30mph in the real world you’re doing well; though the power of the engines should make for efficient cruising, full use of the available performance will see mpg plummet. All Discoverys come with a three-year unlimited mileage warranty. You also get three years’ of roadside assistance cover. Service intervals for the SD4 engine are every 21,000 miles or two years, whichever is sooner. Service intervals for the SD6 engine are every 16,000 miles or one year, whichever is sooner. Land Rover offers various service plans to help with the cost of maintenance, which is likely to be higher with one of these than with a conventional light commercial vehicle. You will also be limited to car-level main dealer servicing facilities, rather than the extended hours of operation an increasing number of van brands are offering. Since this Discovery is classified as a commercial vehicle it is subject to the same tax rules as any other van. This is good news, as vans are taxed at a fixed rate in terms of company car tax and annual VED road tax – and both will work out much, much cheaper for the Discovery Commercial than a regular Discovery passenger car. The Disco Commercial comes in three trim levels: S, SE and HSE. All are extremely well equipped; these are the details as of the 2019MY update. For details of safety equipment see the Safety and Security section of this review. On top of all this, Land Rover offers a considerable options list, which covers additional technology plus practical accessories such as roof bars and other stowage items. Many of these options are available grouped together in various packs, which are good value compared with buying each item within them individually – just make sure you don’t end up inadvertently paying for more than you need. 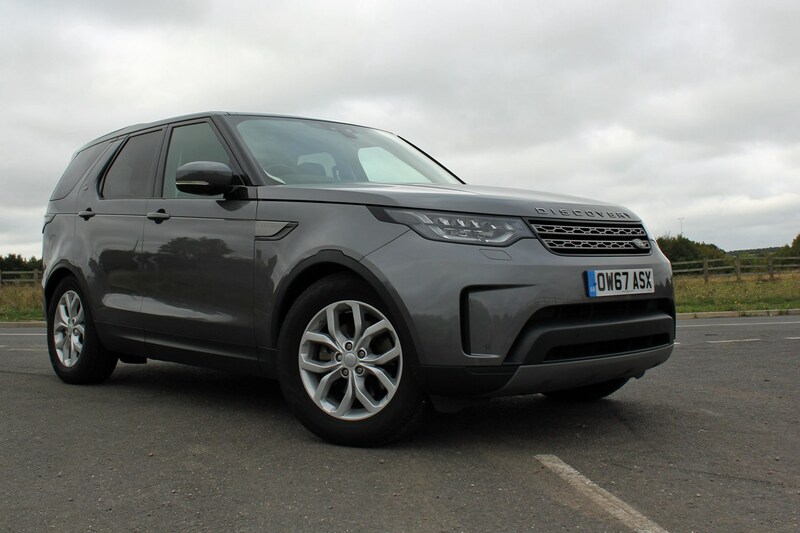 This generation of Land Rover Discovery Commercial is not long on sale, having only been announced in late 2017, and since the passenger vehicle it’s based on isn’t much older, there’s not a great deal of data to go on at this stage. However. Sad to say, but Land Rover is not a brand that has a particularly good reputation when it comes to reliability, and there have certainly been some teething quality control issues with things like door seals (causing whistling noises at speed), as well as technical service bulletins (TSBs – like a manufacturer recall) to fix suspension and oil consumption problems. 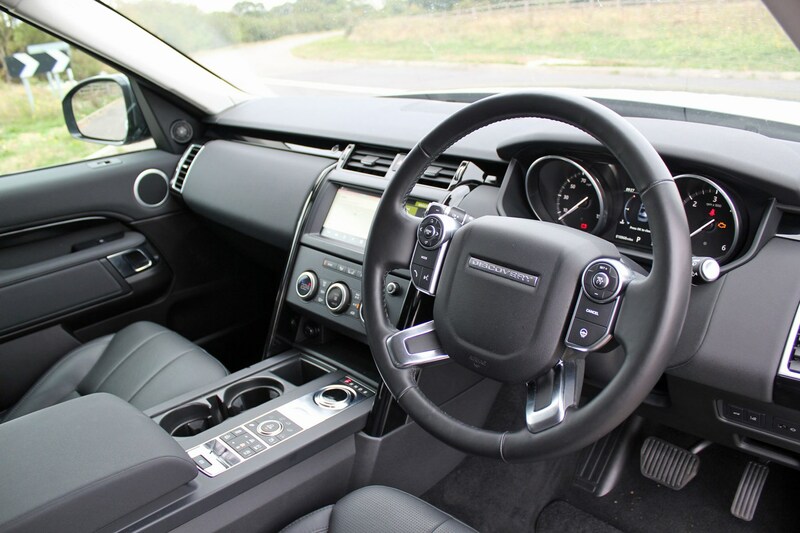 Electronics – a common Land Rover bugbear – are also proving occasionally troublesome, ranging from the power tailgate mechanism to the infotainment system. This is symptomatic of ever-more complex modern vehicles, of course, and Land Rover is not alone in experiencing such issues. But when considering a Discovery as a Commercial vehicle remember that it has primarily been developed as a passenger car, and may not suit the absolute rigours of more vigorous commercial vehicle use. Still, you do get a three-year, unlimited mileage warranty with breakdown assistance as standard. One of the advantages of car-based commercial vehicles is the level of safety equipment, which usually exceeds that fitted to a conventional van and pickup – and certainly, the Discovery Commercial is not short of gear in this category. All Discoverys are fitted with an alarm and immobiliser. As a car-derived commercial vehicle, the Disco doesn’t shout ‘I’m a van!’ at would be thieves, and is perhaps therefore less likely to be targeted by opportunists looking for tools or other equipment to steal. However, as its basis is a high-end vehicle, it may be targeted by car thieves instead. So, as ever, we’d advise you avoid leaving anything inside the vehicle that you can’t afford to lose should the worst happen. Which Land Rover Discovery is best for me? While the Land Rover Discovery Commercial comes with a choice of two engines and we find the four-cylinder SD4 model more than powerful, as a premium product some buyers will be keen to choose the six-cylinder motor. And as this variant is taxed as a commercial vehicle – which means at a fixed rate – there is no real financial penalty for doing so. Expect for the purchase / leasing price, and the likely increase in diesel consumption, of course. Similarly, every trim level has plenty of kit, much of which will be superfluous to commercial use – meaning the most basic S model will more than do the job. Therefore, whether the extra cost of an even more luxurious variant is worth it is very much down to you. If buying or selling used, don’t forget to check the Parkers Vans valuation tool to make sure you’re getting a good deal.